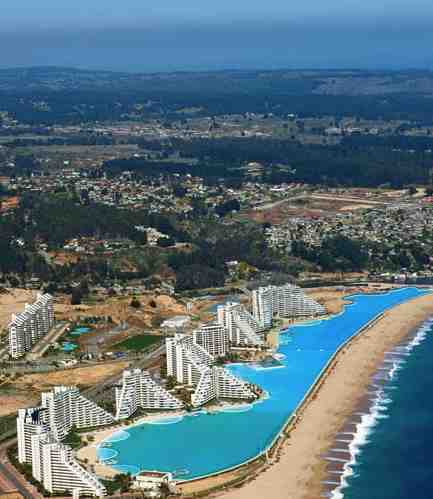 With eight hectares in size and contains an incredible 250,000 cubic metres of water, this artificial lagoon and swimming pool is already drawing the crowds in the South American resort of San Alfonso del Mar in Chile. 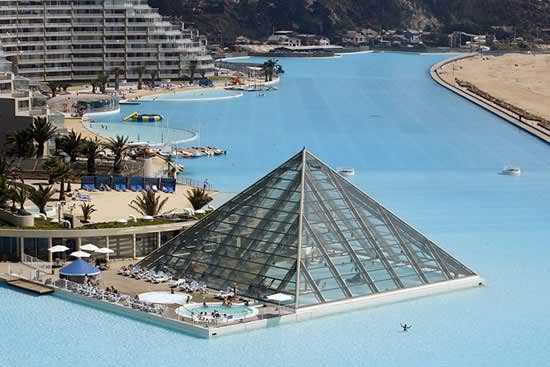 The revolutionary clear water artificial lagoons, transparent to a depth of 35 metres and unprecedented in design and construction methods, are the brainchild of Crystal Lagoons founder, biochemist and Chilean businessman Fernando Fischmann. You may think those Olympic sized swimming pools on TV during the summer games are impressive. At about 50 feet by 25 feet, these pools are more than twice the size of your standard in-ground swimming pool, which is usually around 12 feet by 24 feet. 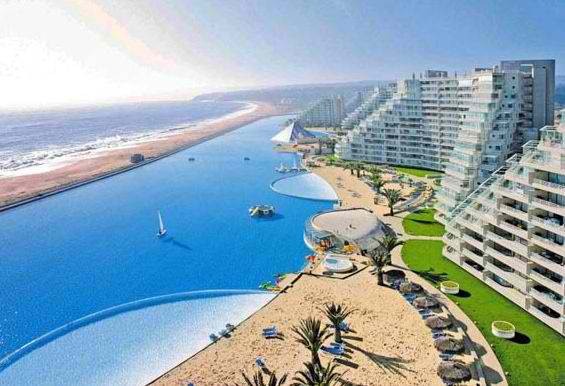 But, even the Olympic pool pales in stature to the mother of all swimming pools found at the San Alfonso del Mar resort in Chile. 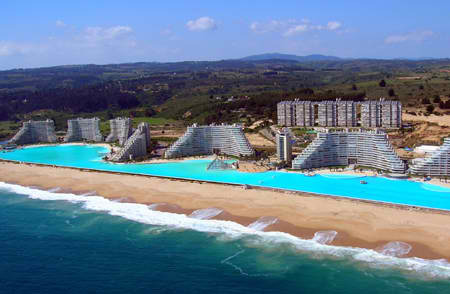 This vast pool, which was recently recognized by the Guinness Book of World Records as the largest pool in the world, lies beside the Pacific Ocean in Chile. The pool measures an incredible 1,000 meters in length, covers an astounding 20 acres, has an enormous 115 ft deep end. Not surprisingly, the pool takes quite a bit of water to fill it. In fact, it holds a total of 66 million gallons of water. The seawater pool is drawing crowds from all over, if for no other reason than its massive size. 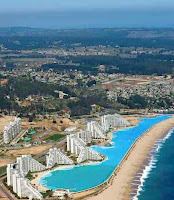 Since its construction, the enormous man-made lagoon has been attracting both locals and tourists to the San Alfonso Del Mar resort at Algarrobo, which lies on Chile's southern coastline. The pool relies on a computer operated suction and filtration system to keep the water fresh and clear. The water used to fill the pool is constantly pumped in from the Pacific Ocean, which can be found right next door to the pool, and it is later released back into the sea at the other end of the pool. Since the pool is still smaller than the sea, the sun is able to warm the water to about nine degrees above that of the neighboring sea and maintains a 26 degree Celsius temperature (almost 79 degrees Fahrenheit).